Then, my friends tell me how awesome I am. Lover calls me Wonder Woman. And I think…why would they think that? I don’t have anything together. I forgot to scoop the litter box last night and put water in kittys dish. I realized the water was empty when kitty started drinking out of the toilet when I was getting ready for work. Filled his water dish, and promptly forgot again about the litter. There is folded laundry all over my living room that needs to be put away. Do these things really make me a disaster though? When I tell people I am, or tell myself I am, does it then become a self fulfilling prophecy? If I’m late to work regularly because I’m “a disaster” am I excusing myself from the responsibility of being on time? Not sure what the answer is, but I’m pretty sure it isn’t to continue saying negative things about myself, to myself and others. 1. Medical testing done this morning shows nothing of concern. This is good! My “big fear” from my last post is not to be concerned. 2. Delicious toast on fresh bread made with love by Lover as I was flying out the door this morning. Yum. 3. My travels this afternoon take me by my favorite tamale joint…I am so excited! 4. Dinner plans with an old friend. We used to use together, a lot. I ran into her after 14 plus years at an AA event, where I found she was also sober now, and I’m really excited to reconnect with her in sobriety. Its so amazing when that happens. 5. Finished writing inventory that I’ve put off for months. It feels good to be done with it, although I’ll feel better after I 5th step it. I’m not sure I’ll be able to meet with my sponsor anytime soon but I have a backup in place should it come down to it. 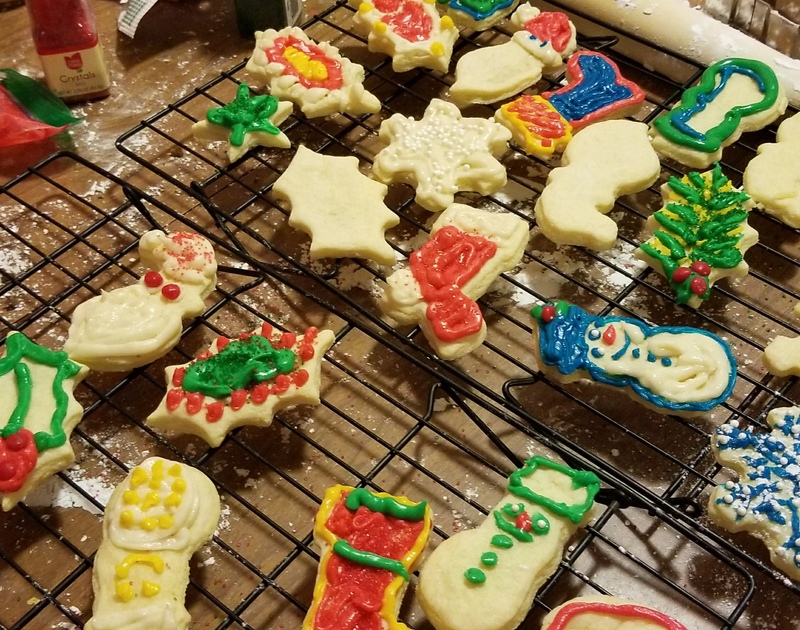 Here are some of the delicious cookies my girlfriends and I made the other night. Feast your eyes, because the cookies have all been eaten already. Posted in Al-Anon, Alcoholics Anonymous, Baking, Blogging, Divorce, Parenting, Postivity, Recovery, Uncategorized.